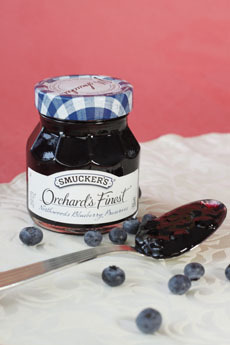 We were excited to receive a shipment of all the flavors of Smucker’s premium line of preserves, Orchard’s Finest. We reached for the blueberry preserves—we rarely see a jar of blueberry preserves or jam—and ate it from the spoon. It was a bit too sweet to mainline, but we grabbed a carton of plain Greek yogurt and made the most delicious blueberry yogurt. And another. And another. Which gets us to today’s tip: Mix your own fruit yogurt with preserves and plain yogurt. It’s “fruit on the bottom” style, only your fruit will be on the top. You control the sweetness. You can add as much or little preserves as you like. You control the portion size. You aren’t limited to those skimpy 5.3- to 6-ounce cups. Remember when all yogurts were eight ounces? You get better flavor. The preserves you use are most likely going to be better quality and more flavorful. We can assure you that our Smucker’s Orchard’s Finest fruit yogurts were head and shoulders more delicious than anything we could purchase. Just stir in to plain yogurt for homemade flavored yogurt. Photo by Elvira Kalviste | THE NIBBLE. You create the flavor of your dreams. Can’t find blackberry yogurt? Fig yogurt? Kiwi yogurt? Want a mango-boysenberry mix? Grab the preserves and mix away. You don’t really save money, by the way; but you get exactly the flavors you want and the exact portion you want. We’ve so enjoyed mixing all eight flavors† of Smucker’s Orchard’s Finest preserves into our yogurt, that we’re trying to save enough for more tips to come. Stay tuned! The “fruit on the bottom” yogurt has an official name: sundae-style yogurt. Instead of a conventional ice cream sundae with topping, there’s yogurt and topping (or a “bottom topping”). Discover the different types of yogurt in our Yogurt Glossary. *THE MATH: FreshDirect.com sells the 32-ounce-size Stonyfield Organic Plain Yogurt for $4.29; the six-ounce cups of flavored yogurt cost $1.19. The 32-ounce container yields 5.3 six-ounce cups. If you purchase five six-ounce cups, it’s $5.95, plus the preserves. †FLAVORS: Coastal Valley Peach Apricot, Fall Harvest Cinnamon Apple, Lakeside Raspberry Cranberry, Michigan Red Tart Cherry, Northwest Triple Berry, Northwoods Blueberry, Pacific Grove Orange Marmalade Medley and Pacific Mountain Strawberry.